Theme aside, I absolutely love this outfit and how it reminds me of early 60s Betty Draper. This is my first dress from newcomer British repro brand Dolly and Dotty and I’ll be honest – I wasn’t expecting it to a) fit this well or b) look this good. Repro dresses generally don’t on me (without alterations), which is why I always go for separates. Anyway, the brand is on the cheaper end of the scale, with most dresses costing around the £35 mark, but for that, you get lining (I have two and both are fully lined) and a fabric belt with actual holes, grommets and a loop. I was sent a matching headscarf too and while it’s not pictured here I should point out they make them for most of their prints, which for someone who loves matching like I do, can only be a good thing. It certainly all feels like pretty good value for money. I’ll be honest, when I first put it on my dismayed thought was ‘ack, this is a small 8… am I still breathing? !’ but somehow the cotton has now stretched the little it needed to fit me like a glove, kind of like jeans do (and my waist-shaper has helped smooth everything out). The shoulders aren’t too broad, nor the sleeves too tight (but, being non-stretch cotton, it’s the usual difficulties in moving your arms above your head) – and the skirt is my favourite length at just below my knee. So for fellow petites (I’m 5’1″), this dress is especially worth a look, although, warning, if your bust is bigger than the size guide, go up! Like I say, there’s no stretch, other than the bit of natural give you get from cotton. I can’t wait to show you the other dress soon – it’s also been an instant winner for me. 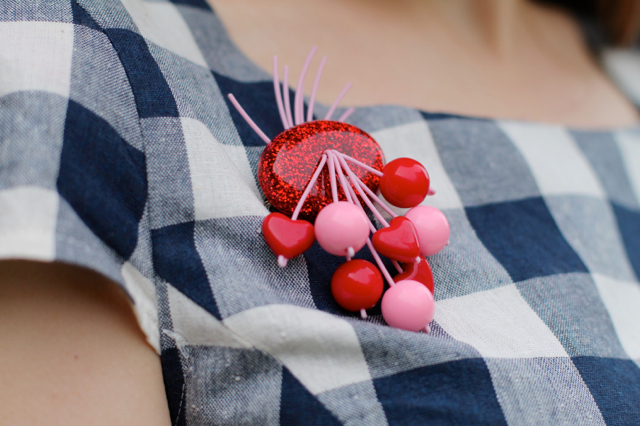 I’m going to be keeping an eye on Dolly and Dotty for affordable, cute day dresses in future. Side note: this is a bit of a weird location and although it’s where I planned, it’s not in the direction I planned. Just in front of me is the River Cam, complete with punts floating along. I thought it was going to be sort of romantic to have couples punting past in the background, but the sun had other ideas and the lighting just didn’t work. The neon coats of huge punts of tourists weren’t ideal either, nor were the lads who wolf-whistled, making me grimace in approximately 40 photos. What you can actually see is some of Magdalene College, which is where one of my best friends studied and where I’ve been to shoot photos a few times now on different spots (here and here). I love this outfit! And yes we are twins with our matching purses 🙂 I have been eyeing Dolly an Dotty lately and have heard such great reviews, it is hared to believe all of that quality in such well-priced garments! They are very well-priced for what you are; I've certainly paid more for less where repro is concerned, in the past… But, you know, they're still not up to the quality of the top end repro brands, don't get me wrong. For a budget option, though, they're very good. This does fit you wonderfully and I adore the plaid. Lovely outfit, it is a really nicely shaped dress. Looks great with the red accessories. What a cute outfit! You look adorable! Aren't Dolly and Dotty fantastic? I have been most impressed with their quality, such well made and affordable dresses. And it would be a crime not to mention that purse and those adorable heels – too cute! Aw, thanks Harlow! I guess dressing in the spirit of the holidays is something I've been doing from a pretty young age – lots of practice! I just got my first dress from Dolly & Dotty too, and I also love it! I chose a purple polka dot sleeveless one and it's also a really good fit which I was surprised about too. I wore it this weekend to watch Mary Poppins at the theatre, but didn't manage to get photos (far too rainy! ), so I really need to get out and do some. I know what you mean with photo locations too – it can be very frustrating having a setting in your head only to realise that the lighting doesn't quite work or something similar – these still look gorgeous though! Very pretty indeed! Take care! Hooray for a brand that looks good on petite people without ten billion alterations! This dress is adorable and I just love all the red accessories you paired with it. So perfect. That dress is really beautiful and your outfit is just the best! I love bright red accessories with blueish dresses, they give just the right amount of vavavoom to an outfit. I've also heard about Dolly and Dotty, but I haven't bought anything from them yet. Somehow I might have judged them before trying out their clothes, because they remind me of Lindy Bop which doesn't have the best quality and Hell Bunny whose clothes never have any lining. But if it DOES have lining, seems like I need to try out their clothes. They have a really nice and versatile collection after all! You look absolutely exquisite in this sweet, feminine dress, which you've accessorised beautifully. I love the heart-shaped bag, and the red accents in your outfit. The whole look is really romantic and playful, and suits you perfectly. 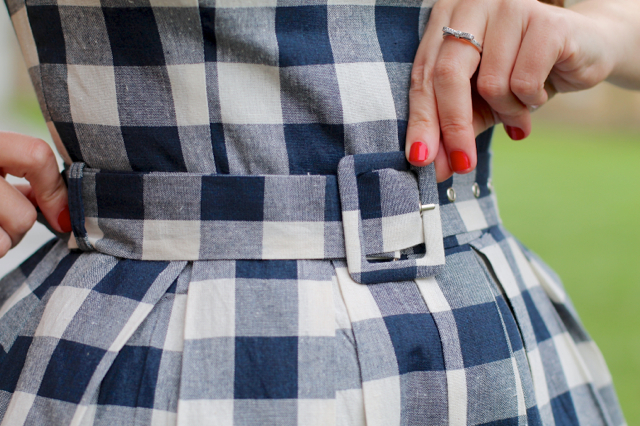 Gingham is always a winner, but the red touches really make the look special. 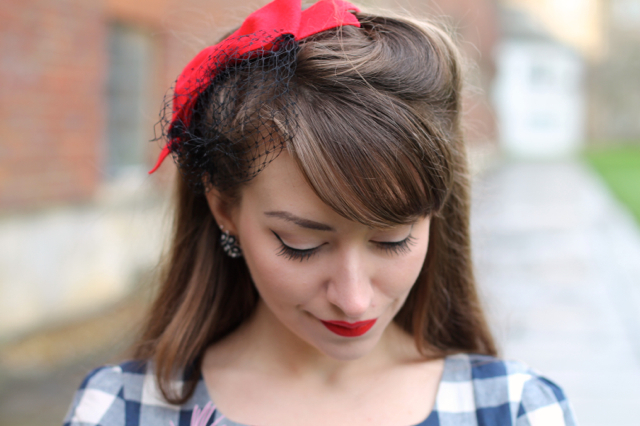 Your fascinator is the perfect finishing touch! this dress is Super Super Super Super Super Super Nice!…what a pretty outfit! Whoops, totally missed this post. I love the dress! It's very on point for the holiday while being unexpected and non-traditional. I think my favorite detail is the veiled fascinator, it's really pretty. LOVE this dress, and the entire look!